Gentrification, suburban sprawl, homogenization----we all have our takes on it. Inflated rents, overpriced restaurants, and multiple Starbucks are the clear symptoms. At the Municipal Arts Society talk at the Urban Center on Wednesday night, Francis Morrone takes us back in time to examine the origins of gentrification in New York City. Strikingly, it may have been started by a handful of progressive and socially conscious women. 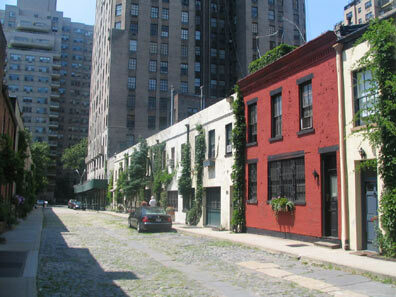 Back in the 1900’s, Greenwich Village’s quaint alleys of today were once abandoned stables and carriage houses. Prostitution and gambling were typically found in these sites. Then a few artists began to take up residence. One of those artists was Gertrude Vanderbilt Whitney. Her wealth also allowed her to be a patron. Her artists clubs ultimately evolved into the Whitney Museum. Someone of her stature moving into this neighborhood was big news. It just became fashionable and people were responding. Going for a more modest look, architect Frederick Sterner began removing stoops from the surrounding Federalist and Neoclassical row houses as well as painting over the red brick with more subdued colors. Edith Wharton’s and Ogden Codman’s Decoration of Houses achieves wider influence. A luxury apartment building goes up a few blocks north of MacDougal Alley and Washington Mews. Then there was that House Beautiful quote: “Why build something new, when something old can be made so fashionable”. Even when new buildings were erected, they mimicked the carriage houses. The former working class Greenwich Village neighborhood was now hip. Cut to several years later and several blocks north, we have the city’s first Women’s Social Club on Madison and 30th (current home to the American Academy of Dramatic Arts). In addition to being allowed to smoke and swear here, these women continued their patronage of the Arts. They dedicated themselves to the suffrage movement and tended to wounded soldiers both at home and on the front lines of the war. Either as widowers, or with their husbands, these women rejected their gilded lifestyle. They moved out of their 30,000 square foot mansions on Fifth avenue to more modest accommodation on the East River or even all the way over to Brooklyn. At the time, they were literally moving to the slums. They set an example. They made headlines. People paid attention and people followed. It’s bittersweet, I suppose, because the consequences of gentrification can be tragic to so many people. Obviously, there are contemporary parallels. Williamsburg and DUMBO began with artists searching for larger spaces and affordable rents. Now those neighborhoods are overbuilt with luxury condos and lofts. When I go to restaurants, galleries, or music halls in these gentrified neighborhoods, a part of me will always be humbled that this all started with the noblest of intentions.